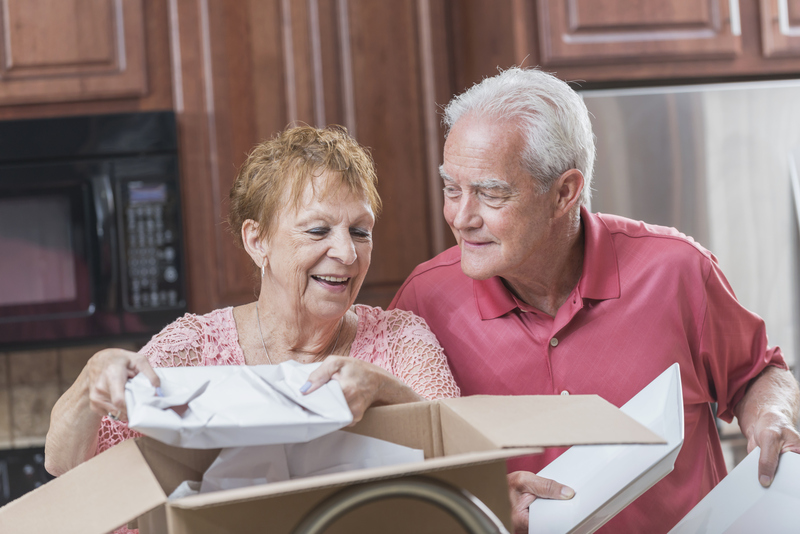 While leaving your home and moving into a retirement community can make your life more comfortable and secure, the thought of moving can also conjure up a variety of emotions. You have spent a lot of time in your home creating memories. Family gatherings, struggles and triumphs are all embedded in your home and in your memory. These are things you will always keep with you no matter where you go. You also have accumulated plenty of possessions, and your new independent retirement living apartment or villa home probably cannot accommodate all of them. Deciding what to keep can be stressful. While going through this process, focus on the new life you are creating, not what you are giving up. Identify items that mean the most to you. Then, create a plan for the other items you will not be taking with you. Can you donate them? Will your children want some of them? Items you may want to keep include furniture, clothes, photos, rugs, clocks, and mirrors — things that remind you of your life or help you get ready for your new one. Happily, for most, there are two items you can cross off your list immediately if you are moving to an Independent Retirement Living Community: your lawn mower and snow shovel! Retirement living is rewarding, with new friends and great activities in a beautiful, relaxed environment. No more worries about keeping up your home, especially when the weather is bad. The good news: plenty of help is available when planning your move. There are many ways to downsize and find new homes for the treasures you have collected over the years. Ann Pluemer suggests estate sales as an option to make money on the items you won’t be taking with you. Ann is a Realtor and partners with Bethesda to offer the “Moving With Ease” program. She notes that transition companies can also arrange for estate sales services. Research several independent living communities. Minimize the amount of information per discussion. Work with your parents on things to keep and let go. Help create a checklist of things to remember. In selecting and moving into a retirement community, finding one close to friends and relatives is a plus. This allows for regular visits. Seniors fear isolation after leaving their homes and neighborhoods. Be positive about the process. Speak to the staff and learn as much about the community — cleanliness, friendliness, and professionalism — as possible. Tour the communities with your loved ones. Visit an apartment, and imagine how it would look with your furniture, and where things would fit. Find out what is served on a typical day’s menu and what’s on the community calendar of activities. Just before the move, adult children can help decorate the new home with items that are both familiar and new. The idea is to cherish the past but create the feeling of an exciting beginning. A good bonus activity is to shop with your senior loved ones as they choose these new items for their new independent living apartment. Preparation and planning reduce anxiety and uncertainty, and can make the downsizing process less stressful. Moving into a retirement community can offer older adults convenience while eliminating the stress of maintaining a full house. Tour one of Bethesda’s Independent Retirement Living Communities in the St. Louis area to experience what this flexible living option has to offer.